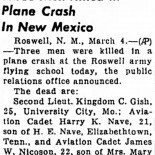 Roswell, N.M., March 4 – Three men were killed in a plane crash at the Roswell army flying school today, the public relations office announced. Second Lieut. Kingdom C. Gis, 25, University City, Mo. 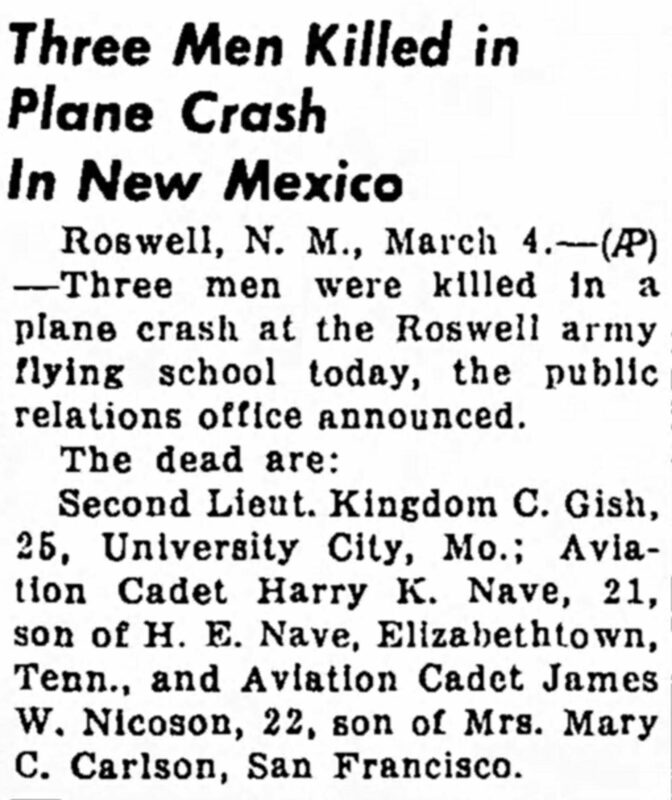 Aviation Cadet Harry K. Nave, 21, son of H.E. Nave, Elizabethtown, Tenn.
Harry K. Nave was born around 1921 in Tennessee. He enlisted with the Infantry on 16 Septemer 1940 at Elizabethton, Tennessee. He was the son of Henry C. and Hattie Mae Gouge Nave and is buried in the Laurel section of the Happy Valley Memorial Park, Elizabethton, TN.